Georgia Tech went for two in the second OT against Tennessee, failed and lost. Was it the right call? Earlier this season, in the second overtime of its season opener against Tennessee, Georgia Tech scored a touchdown to pull within one, but eschewed kicking the extra point and decided to attempt a two-point conversion for the win instead. The attempt failed, and Tennessee came away with a 42-41 win. Obviously, Yellow Jacket coach Paul Johnson would like to have that play back. But disregarding the outcome, did he make the right decision? How does any coach decide when to go for two? And how has that thinking changed over the years? Despite the number of games per season increasing by 66 percent since the two-point conversion was introduced, the number of attempts per season has decreased by 80 percent. 1970 saw the highest percentage of made two-point conversions at 47.1 percent; 2014 saw the lowest, at just 34.3 percent. Rutgers holds the record with 2.22 successful two-point conversions per game in 1958. For reference, only five FBS teams had more than two successful two-point conversions on the season in 2016. 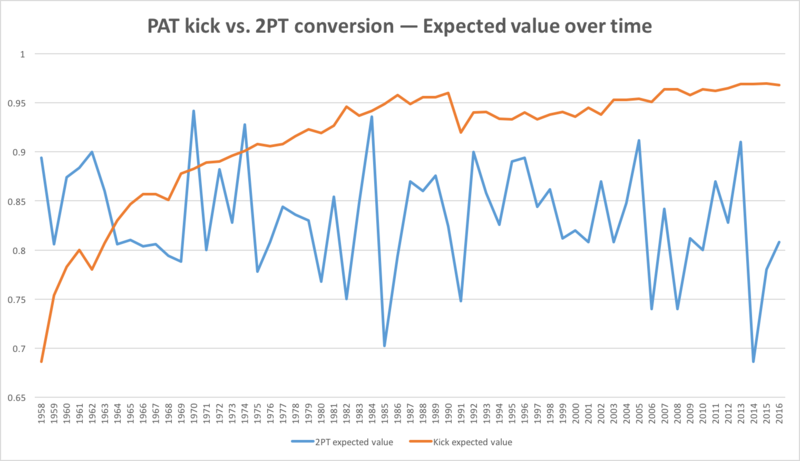 A two-point conversion has had a higher expected point value, on average, than a kicked PAT in eight different years, the last of which came in 1974. According to most statistical models, if a team scores a touchdown to cut the deficit to eight points late in the game, that team should attempt a two-point conversion, even though conventional wisdom says to kick the PAT. We'll get into this strategy later. Since 2008, two-point conversions have been attempted less than one percent of the time after touchdowns. To answer those earlier questions, let’s go back to the beginning. To 1957, the last year before the two-point conversion was introduced to college football. Back then, the goalpost uprights were 18 feet, six inches apart, as they had been since 1876. And that year, 1957, college kickers converted PAT kicks at an average click of 65.3 percent — far from automatic. So when a new way to score after a touchdown was introduced the following year, teams jumped at the opportunity. In the 578 games played in 1958, there were 1,371 two-point conversions attempted — a record that still stands. What’s more impressive is there were only 1,295 PAT kicks attempted that year, making 1958 the only year in college football history where two-point conversions were attempted more often than PAT kicks. So, were college coaches making the right decisions after scoring touchdowns in 1958? A quick way to figure this out is to look at the expected point value of each option, i.e., how many points a team can expect to score on an average play. To do that, we take the percentage that each option is successful, and multiply it by the points awarded for that option. For example, if a team converted 50 percent of their two-point attempts, that team's expected point value for two-point conversions would be one point (0.5 x 2). One year after the two-point conversion’s grand entrance, in 1959, college football saw another rule change: goalpost uprights were widened to 23 feet, four inches. Successful PAT kicks skyrocketed that year. In 1959, PAT kicks were converted at a rate of 75.4 percent — the highest percentage ever at that time. And it only went up from there. This threw a wrench into the two-point conversion’s coup attempt. Suddenly, PAT kicks were becoming more and more of a sure thing. The scales tipped back towards kicking in '59, as PAT kicks were attempted 59.8 percent of the time after a touchdown. Two-point conversions would never again be the preferred way to tack on extra points after a TD. Still, college coaches weren’t ready to abandon the new method just yet. For the first six years after the two-point conversion was introduced, it was attempted an average of 33.2 percent of the time after touchdowns, and actually had a higher expected point value than the PAT kick. The PAT kick would become the smarter choice in 1964, as kicks were converted 83 percent of the time that year — a new high — and two-point conversions were successful just 40.3 percent of the time — a new low. Those success rates were a sign of things to come. The two-point conversion would have two brief resurgences: One in 1970, when two-point attempts saw a still record-high conversion rate of 47.1 percent, and PAT kicks were successful just 88.3 percent of the time; and one final time in 1974, when two-point conversions' expected value of .928 points just barely outpunched PAT kicks’ expected value of .901. Since 1974, there has not been a single year when two-point conversions have been more valuable on the whole than PAT kicks. But that doesn’t mean the play is antiquated. Far from it. Through Week 6 in 2017, there have been 108 two-point conversions attempted in the FBS, with 43 succeeding. Over the past 10 years, there has been an average of 235 attempts per season, or 0.28 attempts per game — a far cry from the 1.14 attempts per game during the first 10 years of the play's existence, but not an unsubstantial amount either. Over the past 10 years, two-point conversions have been attempted after less than 1 percent (0.42) of the touchdowns scored. The success rate has gone down just a bit as well, from an average of 42.7 percent in the first 10 years to 40.5 percent in the past 10 years. So why have two-point conversion attempts fallen off since the 1960s? For starters, when they were first introduced, the novelty of the play led more coaches to test the waters, and inexperience made it harder for teams to defend against it. 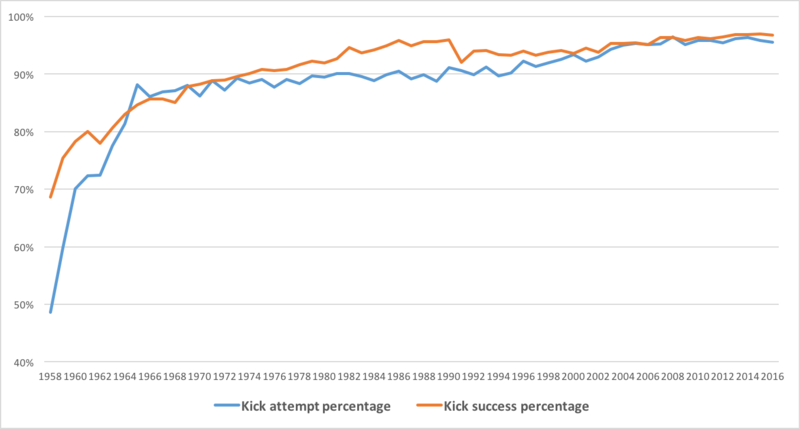 More importantly, PAT kicking has gone from almost a toss-up to pretty much a guaranteed thing, not dipping below a 92 percent success rate since 1980. But there are plenty of circumstances when a two-point conversion is the smarter move. Some are obvious: When trailing by eight points with under three minutes to play, scoring a touchdown and going for two is common sense. But that is just the tip of the iceberg when it comes to situational analysis of when to employ a two-point conversion. Researchers at Michigan and Rutgers have tackled this problem, and sports statisticians have used that research and more to develop charts that can help coaches determine exactly when to eschew the PAT kick and go for two. One such chart, powered by footballcommentary.com's Dynamic Programming Model, looks at the time remaining in the game, combined with the team's lead after scoring a touchdown to dictate what the team should do. For each such scenario, the chart lists a probability for making a two-point conversion. If a team's probability exceeds the listed probability, the team should go for two. If their two-point conversion success rate is less than the listed probability, they should kick the PAT. Let's say with three minutes left, Arizona State gets a touchdown to cut the lead to 24-18. They now trail by six points. Now what? Go for an almost sure-thing kick (the Sun Devils were 39-for-40 on PAT kicks last year), or go for two? But if the score were instead 24-21 after the touchdown, the chart suggests that Arizona State would have to make 86 percent of its two-point attempts for that to be a smart move. Call in the kicker. There is one section in the chart that goes against conventional wisdom. If Team A scores a touchdown to cut Team B's lead to eight at any point in the fourth quarter, this model says that Team A should almost always attempt a two-point conversion (unless they are exceptionally bad at two-point conversions) to try to cut the lead to six. Team A converts the attempt and trails by six points. After the second touchdown, a successful PAT kick will give them a one-point win. Team A converts the attempt and trails by six points. After the second touchdown, a failed PAT kick will send the game to overtime, where they can win. Team A fails the attempt and trails by eight points. After the second touchdown, a successful two-point conversion will send the game to overtime, where they can win. Still, this chart's suggestions change drastically depending on a team's proficiency in the two-point conversion. The average two-point conversion rate was just over 40 percent in 2016. Of course, some teams are much better at this than others. Over the past 10 years, 27 FBS teams have had higher expected point values for two-point conversions than PAT kicks. Of those teams, all but one convert two-point attempts 50 percent of the time or more. And even among those teams, one stands out: Oregon has attempted 60 two-point conversions since 2008 — almost twice as many as any other team — and converted 30, exactly twice as many as the runner-up. Oregon's approach to the two-point conversion, according to former coach Mark Helfrich, was to line up after almost every touchdown in a "swinging gate" formation, giving the team the option of kicking a PAT or going for two, and allowing the holder to make the call in the moment. Sometimes, that approach would work terrifically. In 2010, Oregon went 7-for-8 on two-point conversions, the highest mark in the past 10 years. But the strategy can also backfire. In 2016, against Nebraska, the Ducks attempted five two-point conversions, failed four of them, and lost by three points. Ouch. Through six weeks this year, no team has attempted more than four two-point conversions. The play hasn't fallen out of style, but with the ever-increasing history of the play comes more prepared defenses and more selective usage of the two-point conversion. Oregon's new coach, Willie Taggart, has all but gotten rid of the "attack mode" approach Oregon had become famous for in the past decade. The Ducks haven't attempted a two-point conversion through six games this season, after having averaged 6.67 attempts per season the past nine years. "Go for it when you have to," he said in the preseason, according to The Oregonian. "I'm not going to go for it for the hell of it."